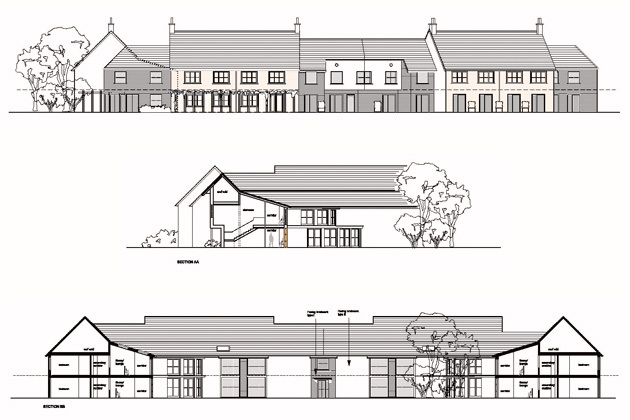 The brief was for a ‘state of the art’ facility providing integrated care to 75 residents. Residents’ rooms are designed for two alternative bed positions, with en-suite facilities suitable for wheelchair use, provided in groups of 15 laid out to maintain a domestic-scale environment. All bedrooms have views outwards to the perimeter of the site. Circulation, avoiding the use of long corridors and dead end areas, is intended to be legible to residents by means of ‘visual access’ and ‘cueing’, and the principal circulation route acts as a ‘street’ with communal facilities accessed off it. The circulation plan allows for both efficient staffing and the safe ‘wandering’ of residents. Communal facilities for each group of rooms, including lounge/kitchenettes and sitting areas, are sited with their group, whilst central communal facilities are located away from residents’ areas to minimise their impact on the perception of the building. Therapeutic areas, offering stimulation, calm or reminiscence, are distributed around the building. The layout optimises the use of sunlight, daylight and local microclimate, to minimise running costs. The internal courtyard provides sitting out areas that relate to the ground floor lounge/dining rooms. Its landscaping, with raised beds and an activity garden, is designed for viewing from inside the building; covered walkways link circulation areas across the courtyard, subdividing the space into discrete areas. 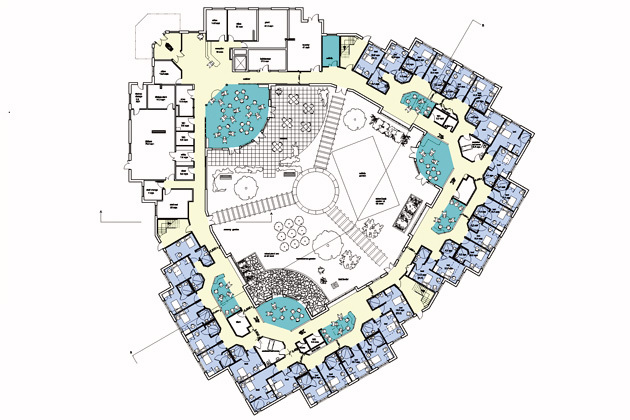 At the centre is a feature intended to enhance the feel of a ‘village square’. The external appearance of the building has been designed to avoid an institutional or clinical connotation.